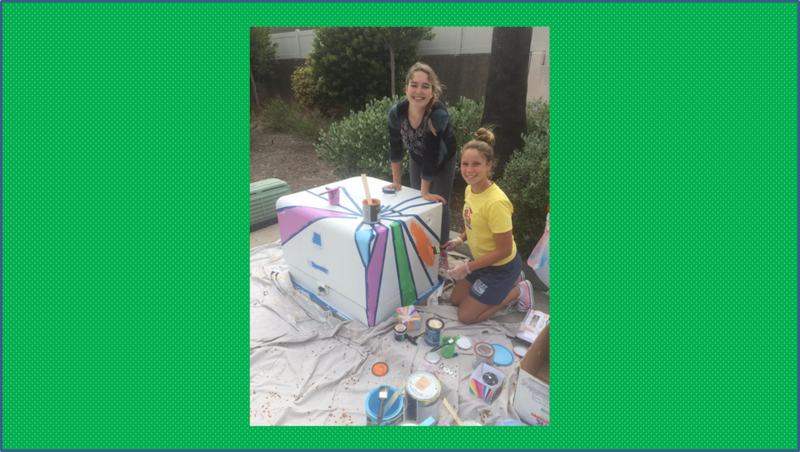 UCCA provides the paint and supplies along with a small stipend. We know there are many creative residents who are anxious to lose themselves in this artistic endeavor. 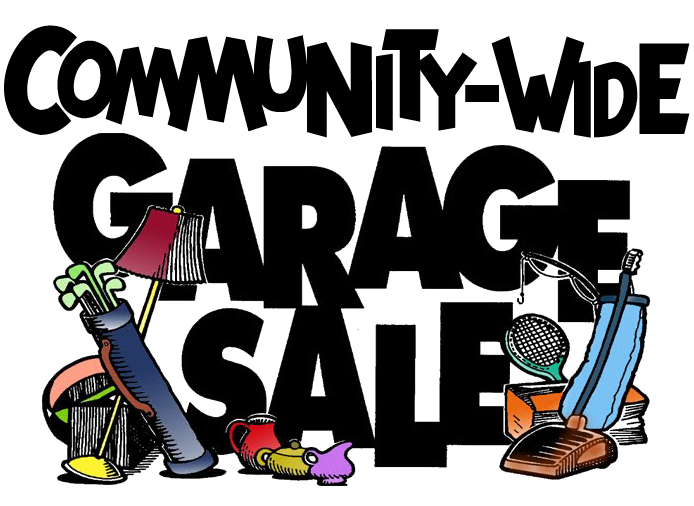 If you would like to be part of this project, please contact Beautification Chairs Merle Langston at merlelangston1@gmail.com or Barbara Gellman at bggellman@yahoo.com for the details. 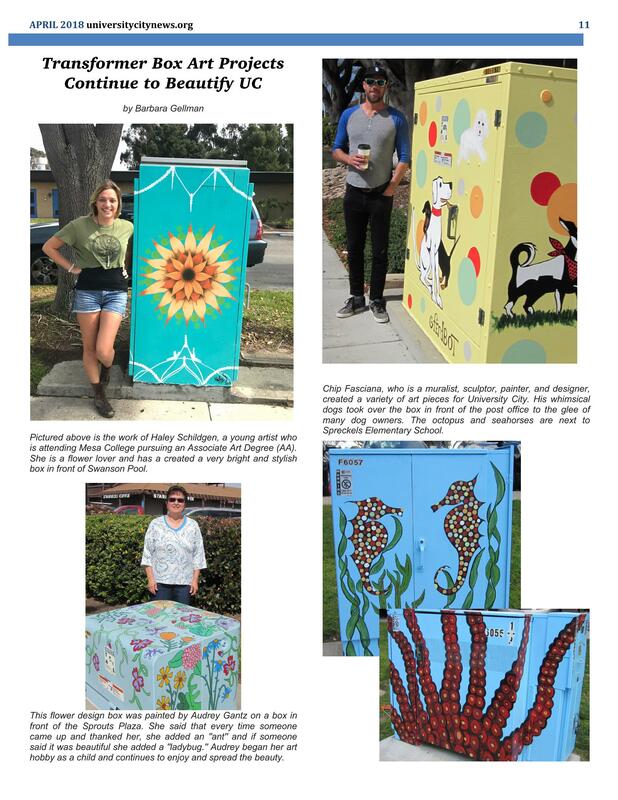 January 2018: The Holiday Gift utility boxes on Gullstrand were updated to reflect a Spring theme. 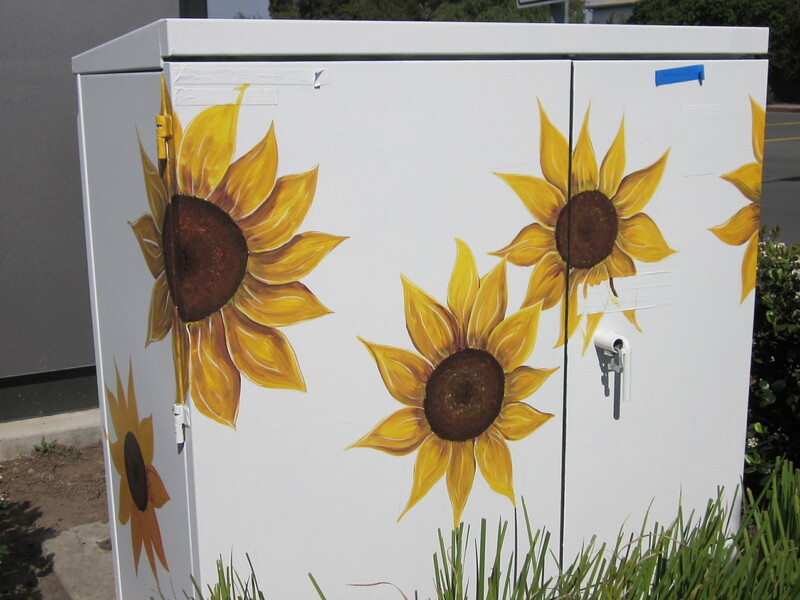 The utility box at Governor and Gullstrand features flowers and doves, evoking a Peace and Renewal theme. The boxes on Gullstrand at Florey were updated with a salute to UC’s love for our pets. 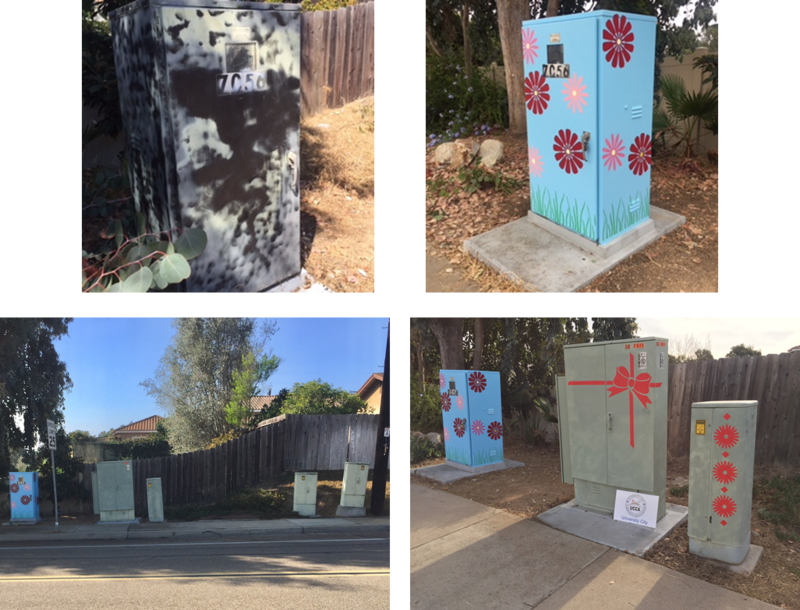 November 2017: Holiday Gift to the neighborhood! 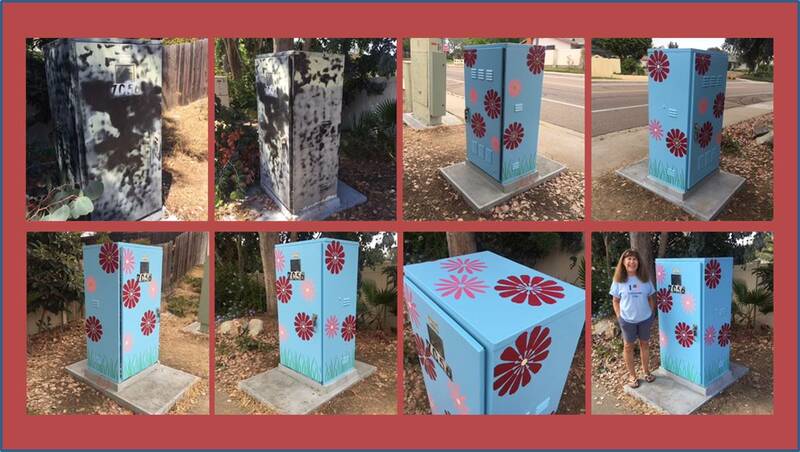 Using donated materials (Con-tact brand self-adhesive removable decorative covering) and donating their time and labor, friends and neighbors Diane Ahern and Kathy Niess installed a temporary art piece on two AT&T utility boxes at 7056 Gullstrand Street. It’s their holiday gift to our neighborhood. 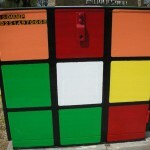 You may recall that last summer, they painted a box at that location that had been covered with graffiti and black paint. 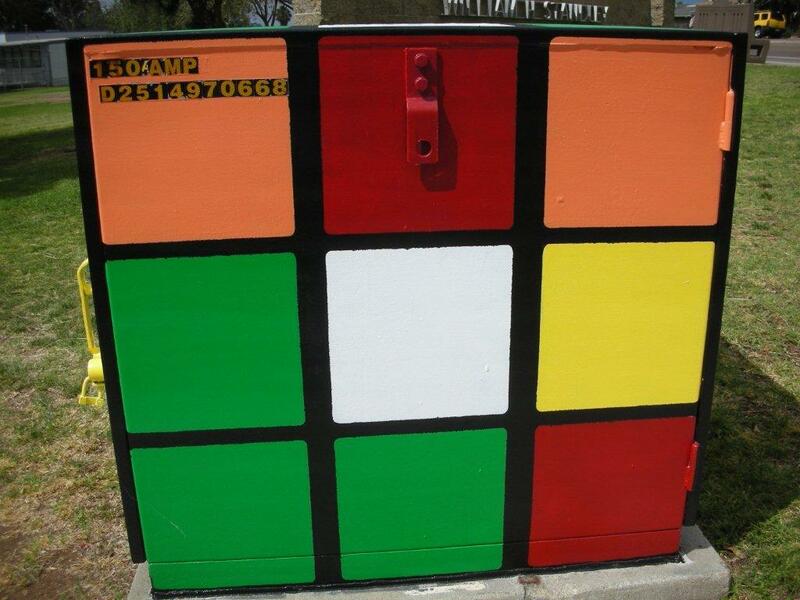 There are a total of six utility boxes and Kathy and Diane have plans for all. Take a look at the attached photo to see phase two of the transformation. 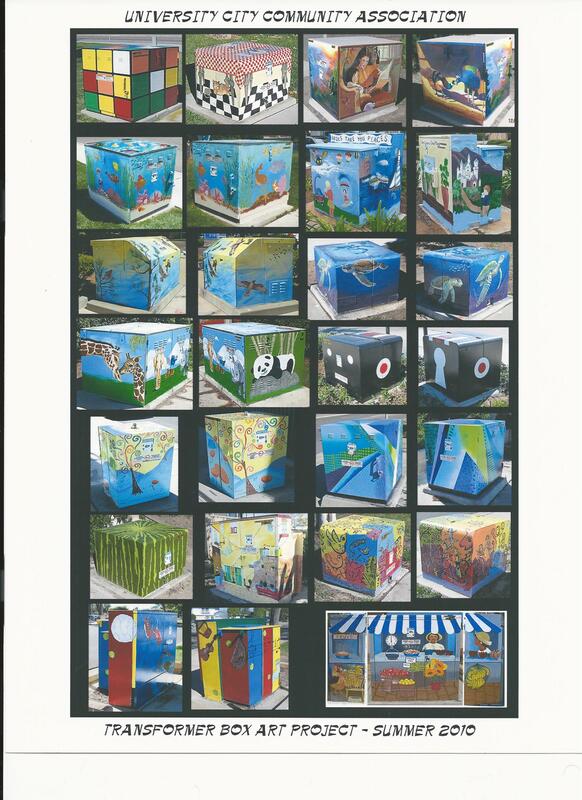 And the next time you’re at the Tot Lot, check it out in person. 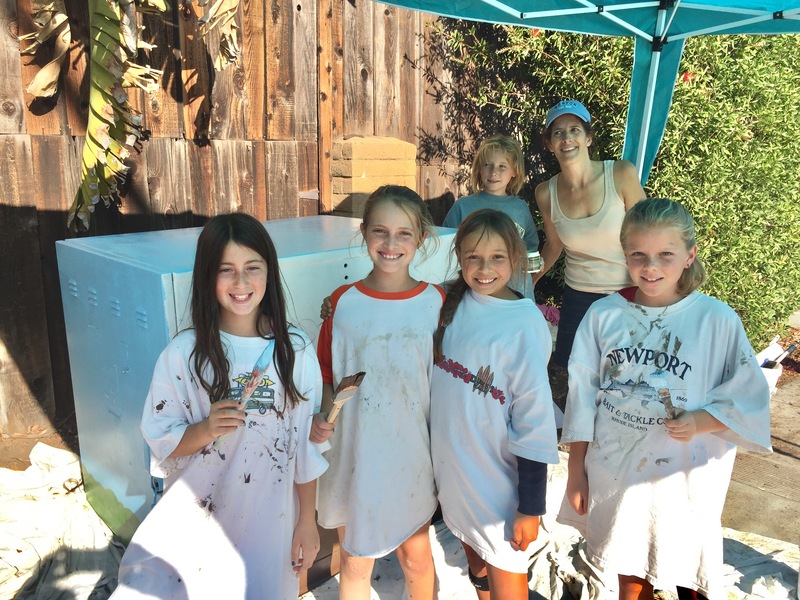 August 2017: Daisy Crazy: Another neighborhood beautification project sponsored by UCCA. Wow! What a difference 6 days and a few coats of paint can make! 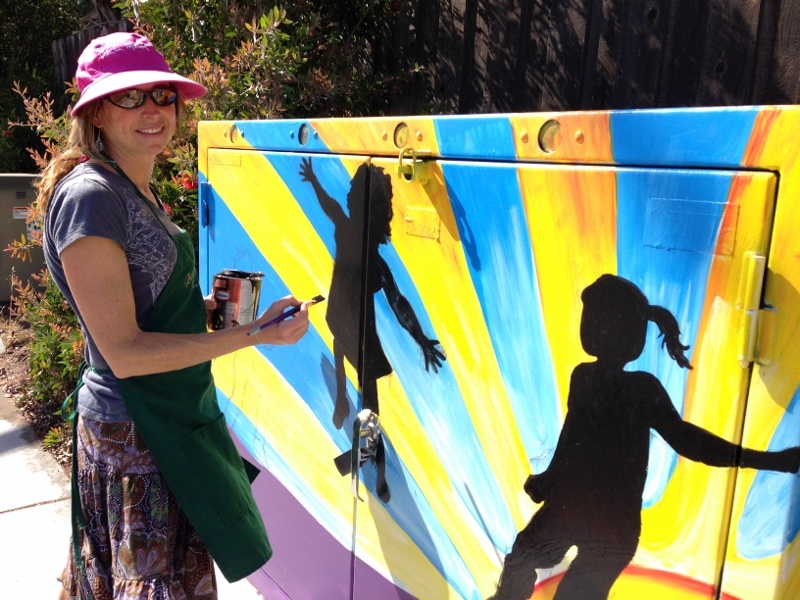 Neighbors Diane Ahern and Kathy Niess (pictured) teamed up to paint the electrical utility box at 7056 Gullstrand Street. 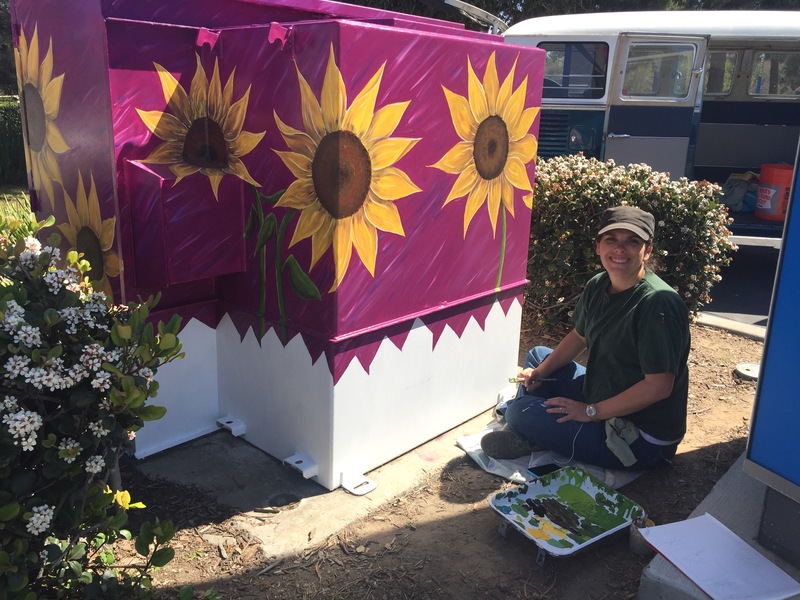 This beautification project is sponsored by University City Community Association (UCCA) and funded through a grant from the San Diego County Board of Supervisors. 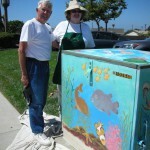 To learn more about grant programs available through San Diego Board of Supervisors, visit http://www.sandiegocounty.gov/. 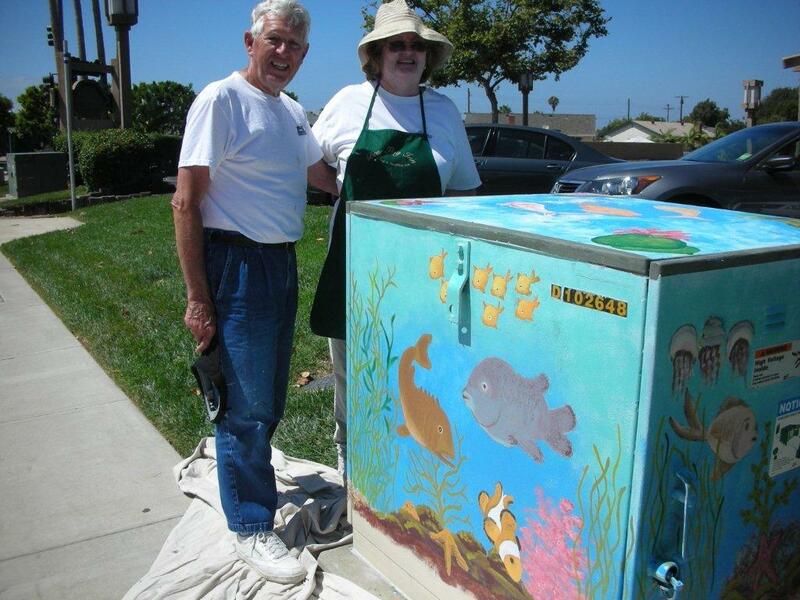 Summer 2017: Local artists Gail and Chuck Connors created a zoo scene on a transformer box at the corner of Governor Drive and Regents Road. This transformation was sponsored by Scott Weathers, owner of AlphaGraphics on Governor Drive. 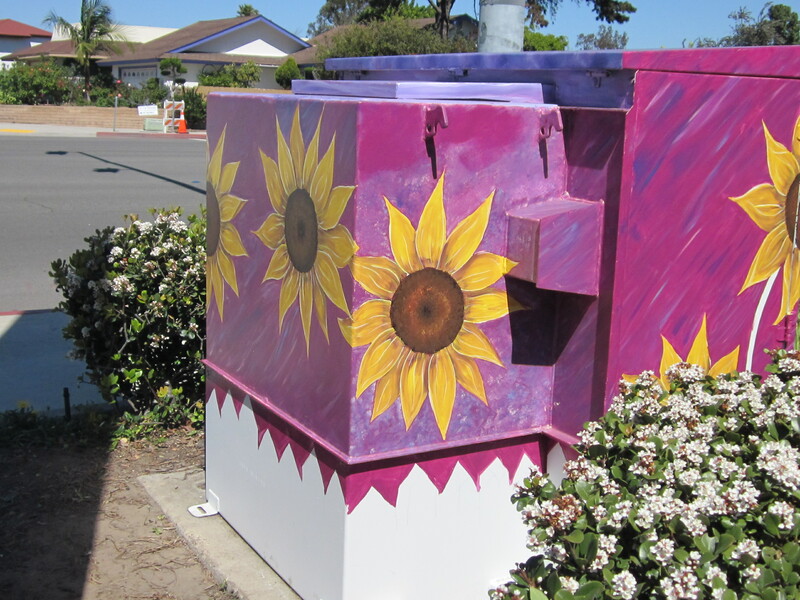 Heidi Hugli, a self-taught artist, turned a large, plain, uninteresting utility box into birdhouses, and Governor Drive and Regents Road at the sidewalk entrance to Our Mother of Confidence Church. This transformation was commissioned and sponsored by Our Mother of Confidence Church. 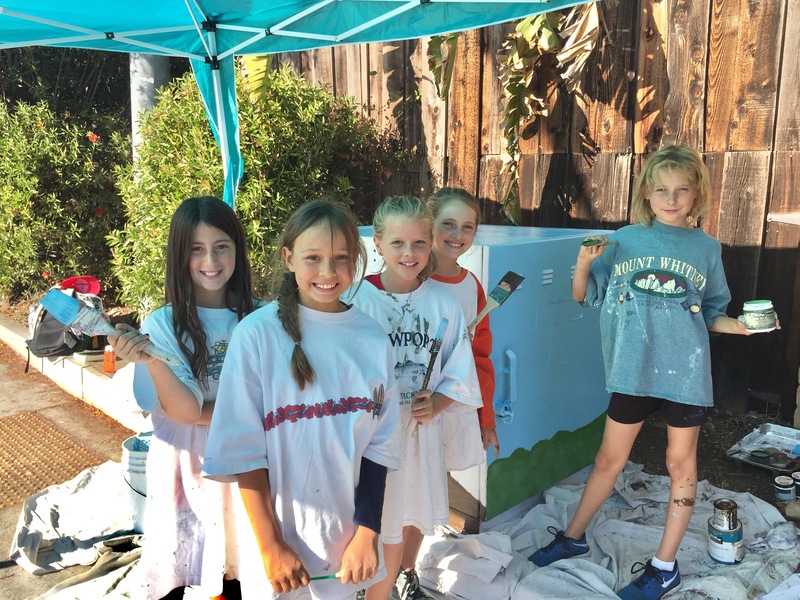 Summer 2017: Girl Scouts Paint for Silver Award Project. We are two 8th Grade girls in Girl Scout Troop 3476. 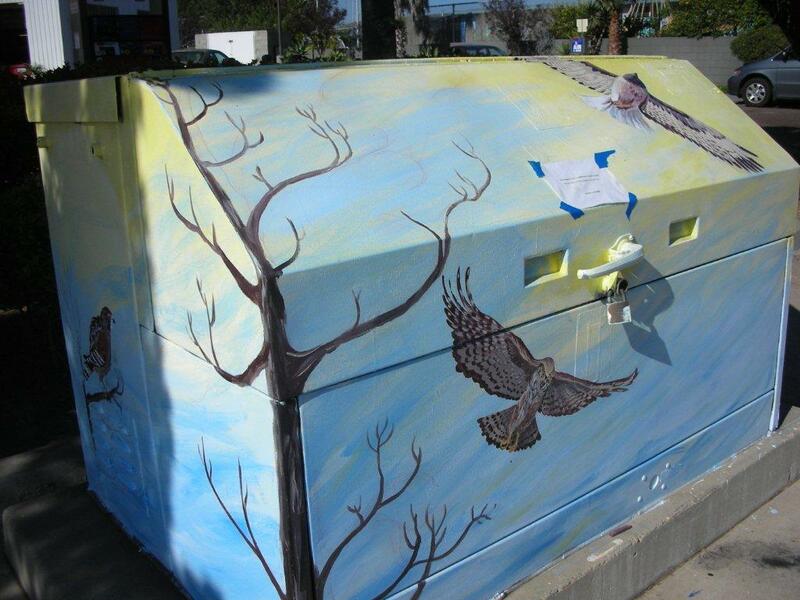 We painted an electrical box for our Girl Scout Silver Award Project. 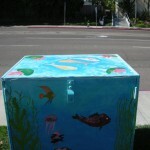 The box is located on the corner of Regents Road and Governor Drive at the entrance to the church parking lot. Thank you and warm wishes, Emiline Mosnier and Mieke van Daelen. April 2017: Although her specialty is Asian brush painting, Stella’s her talent is diverse is not limited to ink and watercolors. 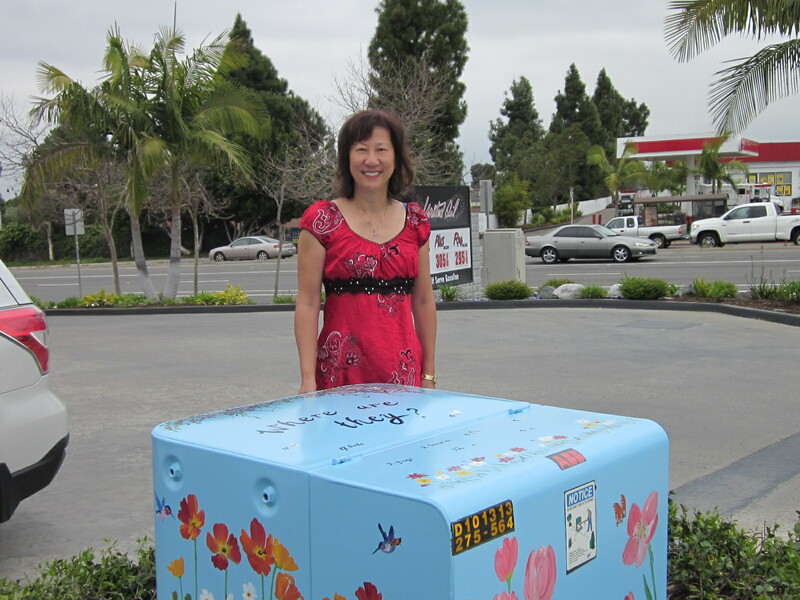 Take a look at her recent design on the transformer box in front of United Oil on Governor Drive and Genesee Avenue. 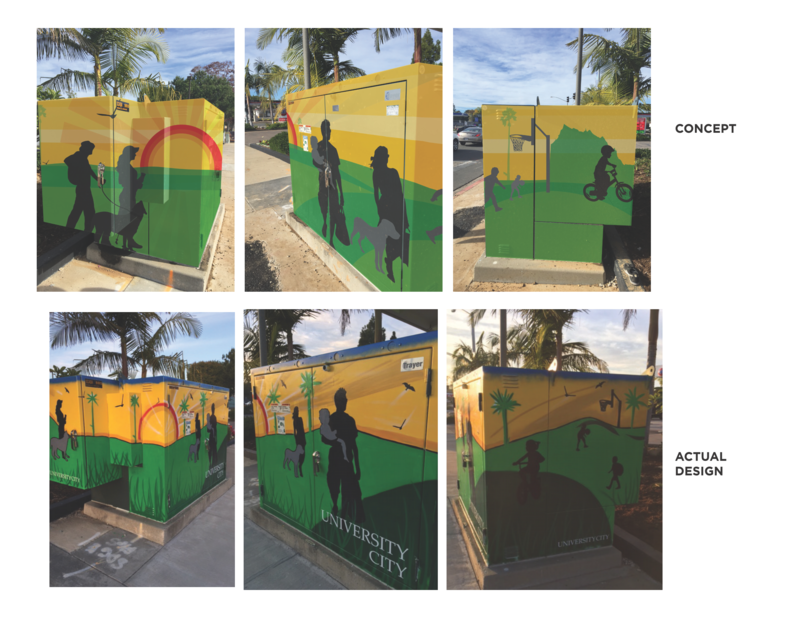 February 2017: From Concept to Reality: UCCA’s recent Transformer Box Art installation! 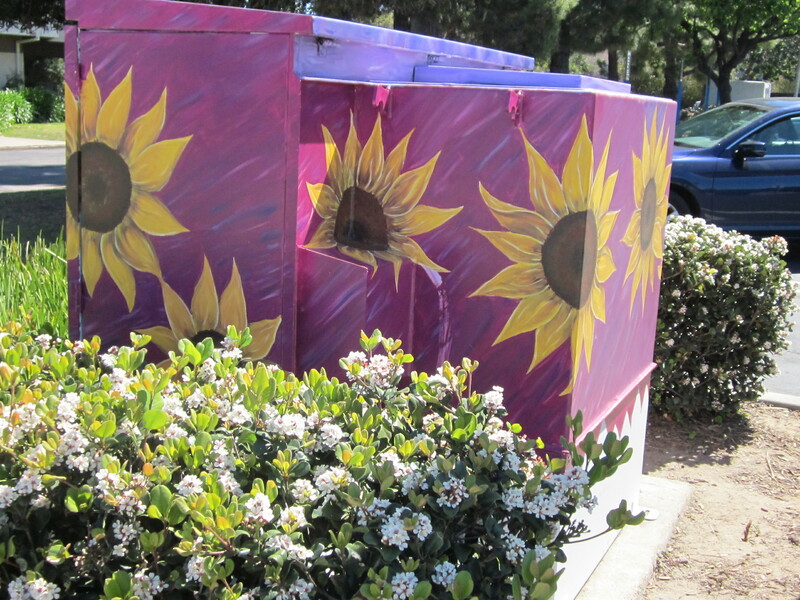 It started as an idea to beatify the intersection of Governor Drive and Genesee Avenue by painting one of the SDG&E transformer boxes and using the new University City banner designs as inspiration. 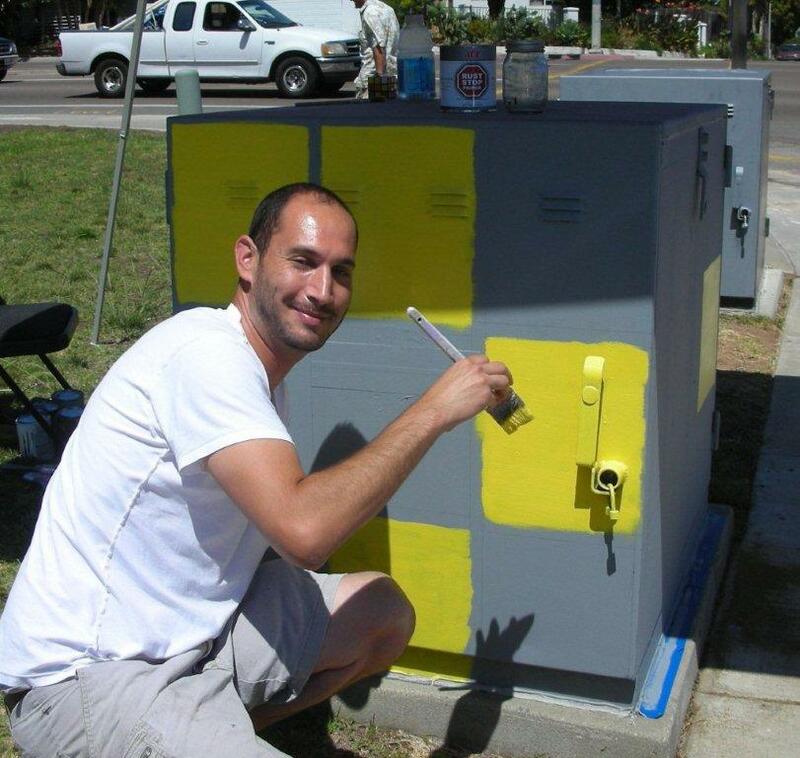 Barbara Gellman, representing the University City Community Association (UCCA) beautification committee, contacted graphics designer Andrew Sanchez of AlphaGraphics (on Governor) to gauge his interest. Andrew had already created the eight new banner designs currently hanging on light poles in UCCA’s banner district. Andrew enthusiastically agreed, and stated that he wanted to challenge himself to create a wraparound, continuous design, to cover all for sides of the highly visible box. UCCA’s design team asked him to include our community name as an integral part to the design to provide place identification to both residents and visitors passing through the busy intersection. Take a look at the completed project and the transformation! 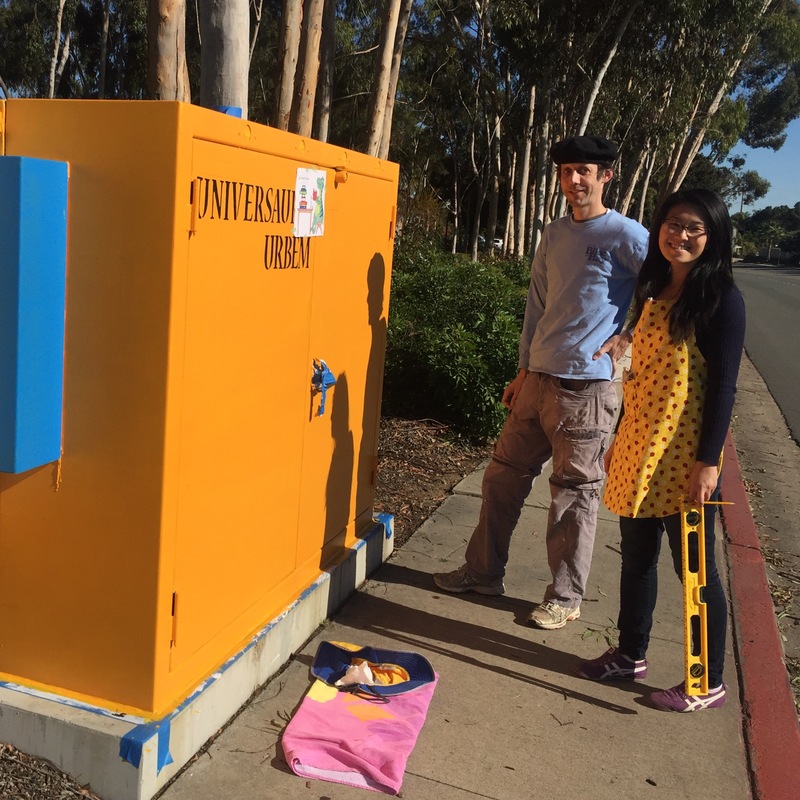 We know you’ll agree with us that this transformer box art installation project, and all our UCCA-sponsored painted transformer boxes in south University City, add both a sense of community pride and an appreciation for public art to our street-scape. 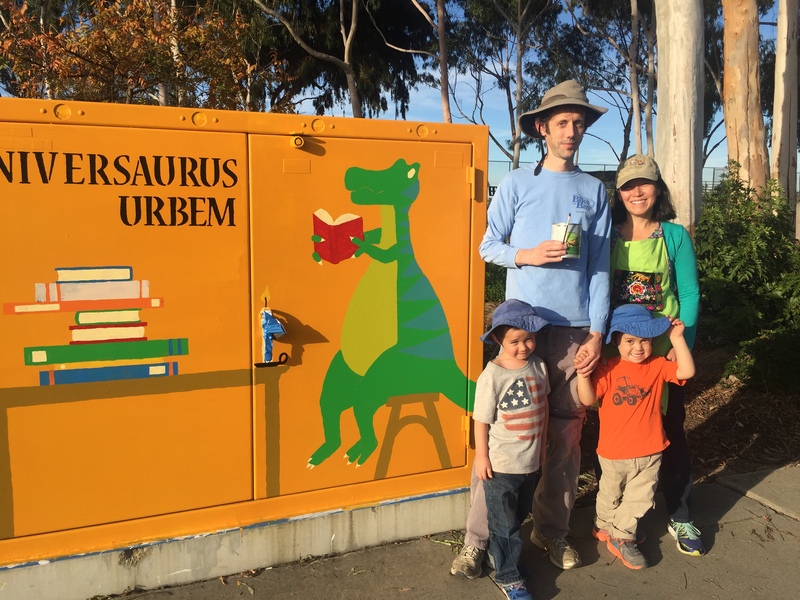 December 2016: Universaurus Urbem beginning to take shape! There is a new dinosaur in town! In a salute to University City, literacy and the ‘Dinosaur Park’ playground at University City Gardens Park at Governor Drive and Gullstrand Street, amateur artists Guido & Patricia Klap and Mychang Krotosky are collaborating to create an original work of art on the northeast corner of Governor and Gullstrand featuring a newly discovered species of dinosaur (Universaurus Urbem) who just happens to love reading. 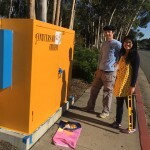 Besides the actual painting, it takes a lot of behind the scenes effort to create a public art piece: developing a suitable design and color scheme, cleaning the box, putting on the primary coat, and the stenciling of letters and design, to name a few. 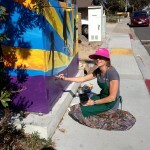 These local artists expect to have their work completed in the next several weeks. Watch for its transformation every time you pass by. 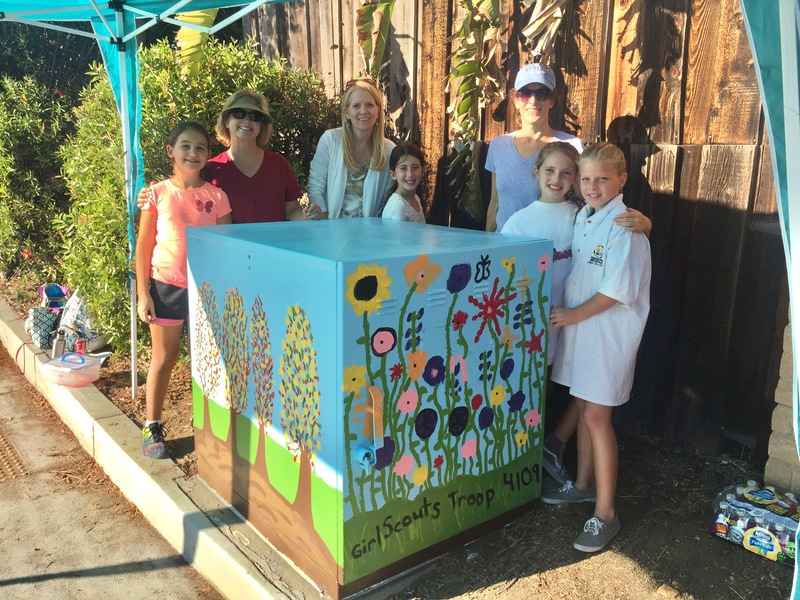 November 2016: Girl Scout Troop 4109 from Curie Elementary is beautifying our neighborhood by transforming a transformer box at Governor Drive and Agee Street. 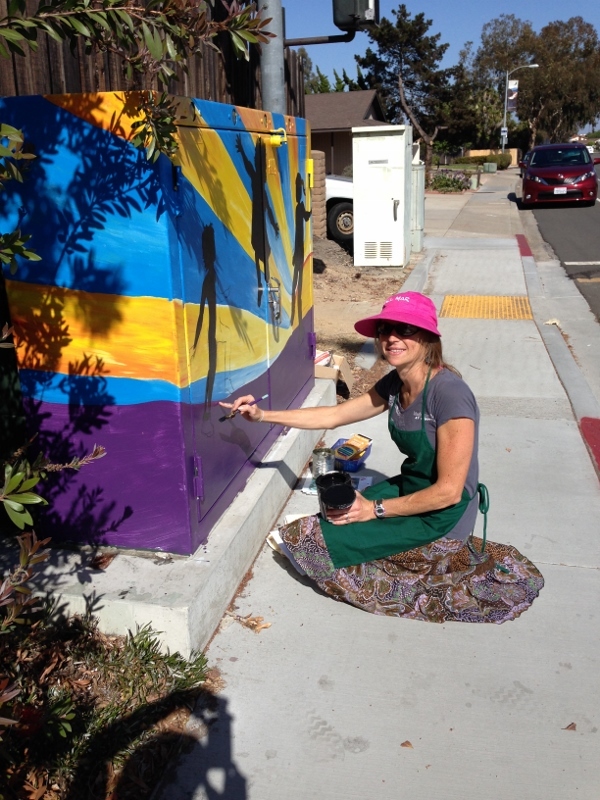 This beautification project is sponsored by University City Community Association (UCCA) and funded through a grant from the San Diego County Board of Supervisors. 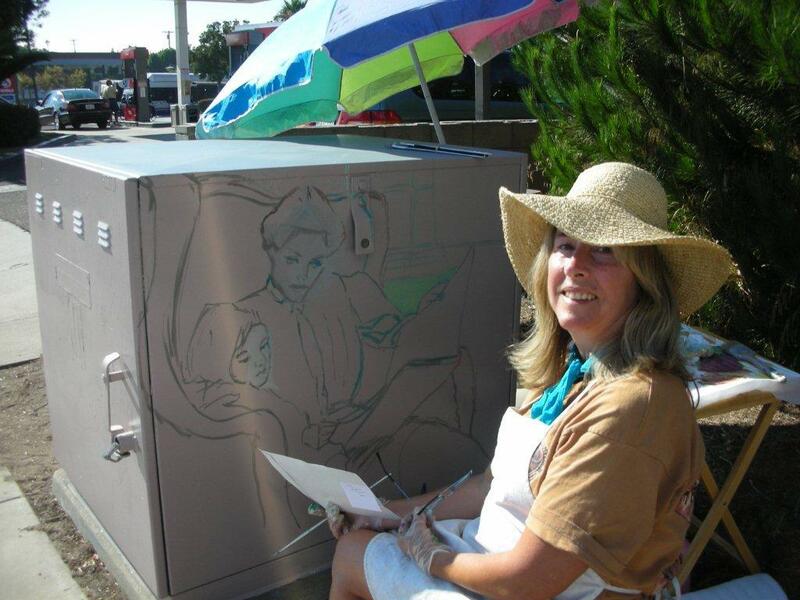 In March, 2016, local artist Julie Dennis transformed an electrical transformer box in front of Chase Bank at Governor and Edmonton. 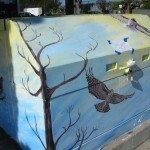 This public art installation was the most recent in UCCA’s transformer box beautification project along Governor Drive. 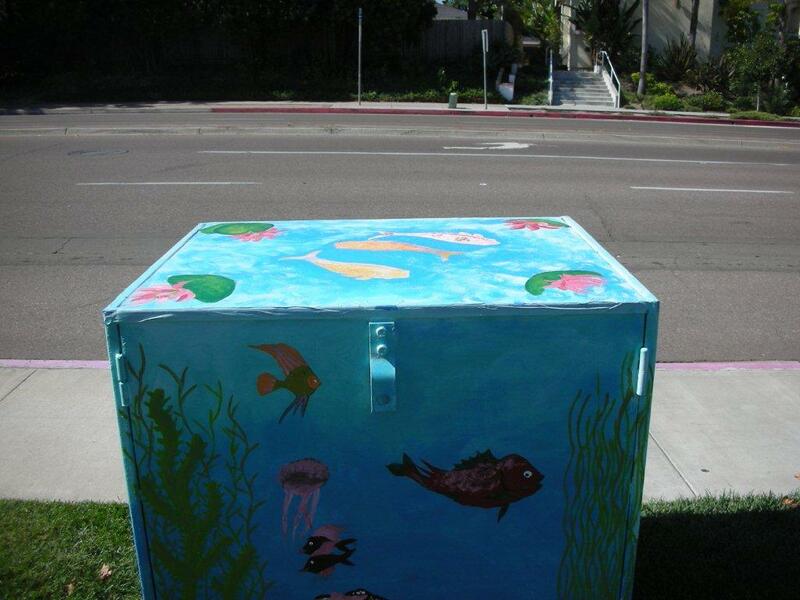 University City Community Association has applied for a grant from the County of San Diego to paint additional boxes along Governor. Stay tuned for updates. 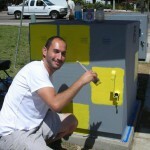 University City Community Association Transformer Art Project: This on-going public art project got its start in 2010. 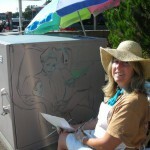 The talented artists not only painted creatively, but they interacted with folks walking by who were curious about their artistic endeavors. 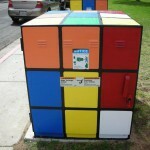 The Rubics cube on the Standley Middle School corner of Radcliffe and Governor drew a huge audience of admirers. “The Miller men,” as they were called, neighborhood toddler triplets, frequently stopped by the Marketplace property near Governor and Regents to check on the progress of two boxes, an aquarium and zoo animals. In front of Curie School, U.C. artist Deanna Ditzter painted a beautiful scene of mother and child reading. She also spent time creating horses in motion on a box at the corner of Governor at Gullstrand. 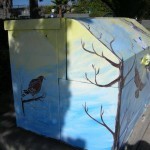 Unfortunately, SDG&E changed the electrical box and that masterpiece disappeared. 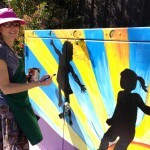 More recently, a transformer box at Agee and Governor was embellished with silhouettes of children playing in the sunshine. 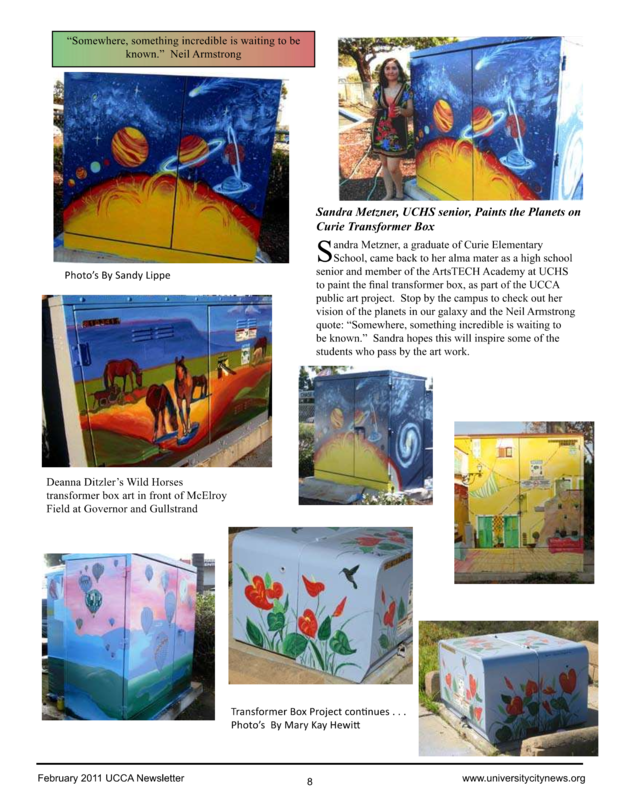 Public art, whether it is street banners or painted electrical boxes, helps make a community special. Take a look.